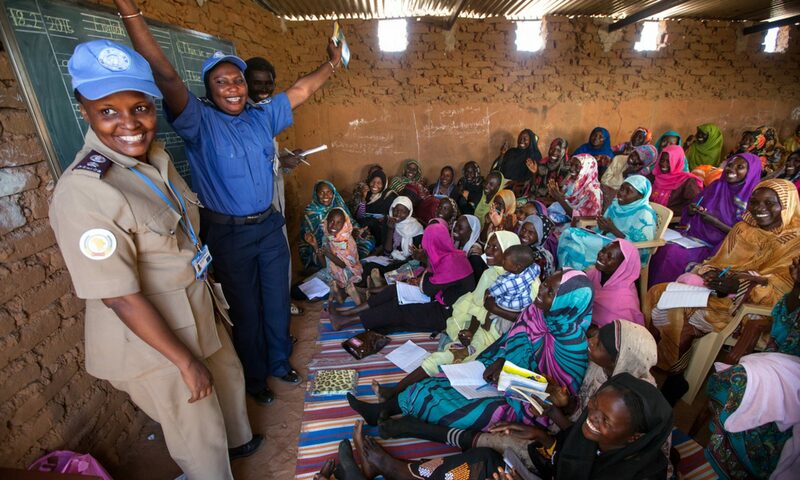 IWD Blog Series – Learn what the Nobel Women’s Initiative has been doing to promote gender equality in the field of Women, Peace and Security. Tell us a little about the Nobel Women’s Initiative (NWI). How would you describe the organization’s overall mission or goals? The Nobel Women’s Initiative is an organization that was founded in 2005 by Nobel Peace Laureates: Jody Williams, Shirin Ebadi, Wangari Maathai, Rigoberta Menchú Tum, Betty Williams and Mairead Maguire. The make-up of the Laureates at NWI has changed over time; the current Laureates engaged in NWI projects and programs are: Mairead Maguire, Jody Williams, Shirin Ebadi, Rigoberta Menchu Tum, Leymah Gbowee and Tawakkol Karman. We use the prestige of the Nobel Peace Prize and the prestige of the six courageous women peace laureates to magnify the power and visibility of women working around the world for peace, justice and equality. Although our offices are located in Canada, we work with women rights activists and peace activists from across the world. That’s a fascinating approach! It brings to mind a quote by Gloria Steinem about using one’s torch to light other people’s torches. How do you increase the advocates’ visibility? Convening: We bring together diverse women’s groups, academics, key decision makers and the media to build new networks and promote collaboration. Shaping the conversation: We articulate a broadly accessible analysis of the impact of conflict, violence, inequity and climate change on women. We emphasize solutions proposed by women’s movements. We share a vision of what a nonviolent, just and equal world looks like. Spotlighting and promoting: We create media and public awareness of the powerful work being done by women activists and movements—and help bring women’s messages to the world. Are there any projects that you are currently working or any upcoming projects that you can fill us in on? Yes. We are currently organizing a conference on “Defending the Defenders: Building Global Support for Women Human Rights Defenders” which will take place in April outside The Hague, in the Netherlands. The conference will bring together over 100 women human rights defenders and those who support them to advance the global agenda for their protection. As you know, this year the International Women’s Day theme is “Make it Happen” and it aims to celebrate women’s achievement and call for more equality. Any words of advice for anyone who is trying to Make it Happen but doesn’t know where to start? The Laureates of the Nobel Women’s Initiative often say that anyone can make a difference no matter where they are from or what they know or have. The potential for change is in all of us. We just have to take it by the horns and run with it. As Jody Williams says: “Worrying about an issue is not a strategy for change. Ordinary people can accomplish extraordinary things when they work together”. Get involved, get organized and celebrate every small step of success. That’s a great segue to the next question 🙂 . Are there any opportunities for involvement at Nobel Women’s Initiative? Yes, we regularly take in volunteer activists for 3 months placements to learn advocacy and communications skills. How can we find out more about NWI ? Follow us on Facebook and Twitter to learn about our ongoing activities and “take action” items and visit the Nobel Women’s Initiative website to learn more about the work we do, and how you can get involved. International Women’s Day falls on March 8. Join in on the conversation by following the #MakeitHappen hashtag on Twitter and be sure to read our other interviews and blog posts to learn about how others are creating change and how you too can make a difference. Previous PostPrevious How are you celebrating International Women’s Day? Next PostNext IWD BLOG SERIES – Read our Interview with Jessica Chandrashekar, an Academic Activist at York University, as she talks about the Tamil genocide and the importance of solidarity activism.